I’m very pleased to announce that Prof. Krishna Garikipati (Mechanical Engineering and Mathematics) has been appointed the new Director of the Michigan Institute for Computational Discovery and Engineering (MICDE). The Institute has grown significantly since its establishment in 2013 as the interdisciplinary home for the development and use of mathematical algorithms on high performance computers at U-M. Prof. Garikipati has been involved as associate director for research since Fall 2014 and is uniquely positioned to take the institute to the next level. MICDE is a joint initiative of UMOR, the College of Engineering, and the College of Literature, Science and the Arts. In the past year, it has seen many new and important developments, including the launching of two centers focused on network and storage-enabled collaborative science and data-driven computational physics; new planned course offerings for the PhD in Scientific Computing and the Graduate Certificate in CDE; new initiatives on industrial engagement; and the establishment of the Scientific Computing Student Club. A number of new research initiatives are also being planned, with broadening participation of MICDE-affiliated faculty, whose numbers continue to grow. 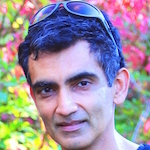 Prof. Garikipati will take over the directorship of MICDE from Prof. Eric Michielssen (EECS) who founded the institute in Fall 2013 and served as director, in addition to his role as Associate Vice President for Advanced Research Computing. Prof. Michielssen will continue as AVP.